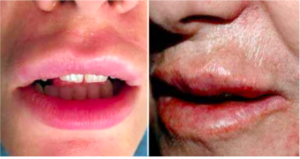 Hyperactive forms of lips need special attention at augmentation, because the lips high mimic activity during procedure can cause filler migration, worsening aesthetic result of correction. Hyperactive forms of lips are bound to irregular activity of different parts of a Musculus orbicularis oris (Orbicularis Oris Muscle, OOM). The OOM has 2 parts . A marginal part purses lips (Fig. 1). A peripheric part extends lips and puts them in a tube (Fig. 2). Hyperactive forms of lips are connected with excess activity of a marginal part of the OOM. Both in static, and in facial expression. In static mode it shows by vertically sloping upper lip (Fig. 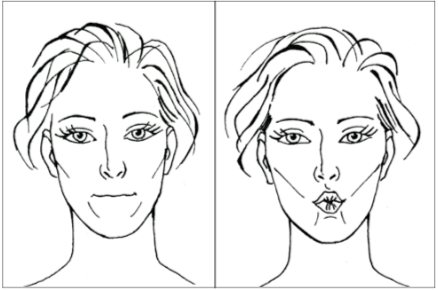 3), in a facial expression by lip folding. I would like to separate two types of hyperactive forms of the lips, associated to different shapes of an upper lip: the upper lip in the form of a seagull and the upper lip in the form of a boat. Fig. 1 and 2: The OOM has 2 parts . A marginal part purses lips (Fig. 1). A peripheric part extends lips and puts them in a tube (Fig. 2). Fig. 3: Hyperactive forms of lips are connected with excess activity of a marginal part of a OOM. Both in static, and in facial expression. In static mode it shows by vertically sloping upper lip. The upper lip in the form of a seagull (Fig. 4) is associated with hyperactivity of a marginal part of the OOM throughout an upper lip. Patients with such a type often complain about a to narrow and sloping upper lip. Fig. 4: The upper lip in the form of a seagull. Fig. 5: The upper lip in the form of a boat is associated to hyperactivity of a marginal part of OOM in lateral parts of an upper lip. The upper lip in the form of a boat is associated to hyperactivity of a marginal part of OOM in lateral parts of an upper lip (Fig. 5). Patients with this form of lips often complain about depressed mouth angles. An Important role plays the white roll for migration of filler after augmentation of hyperactive forms of lips. The white roll is a connective tissue – musculocutaneous attachment on the border of the dermal part and vermilion (Fig. 6,7) . It has the function to restrict inflammatory processes. In addition, it defines the direction of migration of filler after augmentation of hyperactive forms of lips. Fig. 7: Authors: S. Ananyan, A. Stenko, E. Vergun. 1- connective tissue – musculocutaneous attachment on border of a dermal part and vermilion (white roll). 2 – orbicularis oris muscle is riddled spurs (2a) of the superficial fascia (3). The filler injected subcutaneously below the white roll migrates closer to an oral fissure after correction of lips of a seagull form. It leads to sagging of lateral parts of an upper lip (Fig. 8). The filler, injected above the white roll, migrates into the dermal part of an upper lip, resulting in a “cat’s moustaches” effect (Fig. 9) . Fig. 8: Filler injected subcutaneously below the white roll leads to sagging of lateral parts of an upper lip. Besides, the irregular activity of parts of the OOМ in hyperactive forms of lips can lead to a change of proportions of lips after their augmentation. It is the so called “duck effect” after augmentation of the central part of an upper lip (Fig. 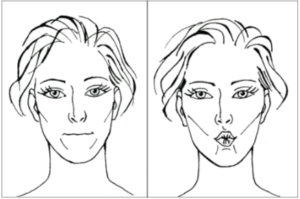 10), promotion of an upper lip forward and its overhang over lower through correction of a contour of an upper lip (balcony effect) (Fig. 11), square shape of a lower lip (Fig. 12). Fig. 9: The filler, injected above the white roll, migrates into the dermal part of an upper lip, resulting in “cat’s moustaches” effect. Fig. 10: “Duck effect” after augmentation of the central part of an upper lip. Fig. 11: Promotion of an upper lip forward and its overhang over lower lip due to correction of a upper lip contour (balcony effect). Fig. 12: Square shape of a lower lip. I offer the principles of correction of hyperactive forms of lips to prevent these adverse effects. Correction of an upper lip in the form of a seagull. Optimum results can be achieved by injection into the OOM with botulinum toxin 2 weeks prior to augmentation with filler [4,5]. It will make activity of different parts of the OOM more evenly, however often it has an insufficient effect. While augmentation by filler in lips in form of seagull vertical injections from the white roll gives the most beautiful turn of an upper lip [2,6] (Fig. 13). In this case I recommend not the hypodermic, but intramuscular level of injection: it can minimize risk of migration of filler. Besides, uniform augmentation of a marginal part of the OOM with filler reduces its excessive activity. To prevent filler migration, I recommend filler injection only within a vermilion and to avoid linear technique for contour correction of an upper lip. It is important to augment a lower lip with forward promotion for harmonization of proportions. One has to keep in mind, that the more we develop an upper lip, the more we have to push forward the lower lip. Fig. 13: Seagull vertical injections from the white roll gives the most beautiful turn of an upper lip. / Fig. : 14: Do not inject into the central part of an upper lip. / Fig. 15: Vertical injection (intramuscular) for augmentation of a lower lip. / Fig. 16: „Eiffel Tower“ technique of Dr. Anna Reznik. It is also very important to perform botulinum toxin injection in MOO 2 weeks before correction of an upper lip in the form of a boat [4,5]. I use hypodermic fan injection of filler in lateral parts of a vermilion of an upper lip while augmentation of this type lip [2,6]. I don’t inject into the central part of an upper lip (Fig. 14). In all types of hyperactive forms of lips harmonization of proportions happens due to forward promotion of the lower lip. 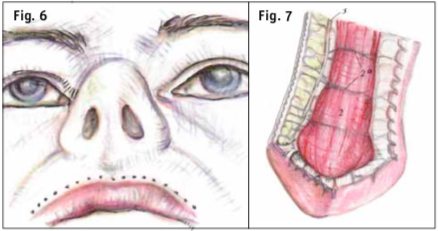 I recommend subcutaneous fan injections, and the vertical injection (intramuscular) for augmentation of a lower lip (Fig. 15). I want to present my technique of correction of a lower lip. It allows to prevent appearance of square shape of a lower lip after its augmentation. I named it “Eiffel Tower” – technique of Dr. Anna Reznik (Fig. 16). 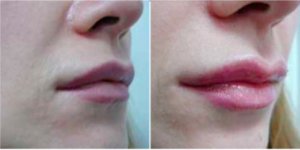 At first, linear intramuscular injections of filler from the white roll of a lower lip to the middle of a vermilion are carried out (they are designated by blue arrows). They allow to push forward harmoniously a lower lip. Then I perform two linear intradermal injections. They begin from border of a vermilion of a lower lip at the level of a projection of tops of the cupid’s bow of an upper lip and meet on the center of a lower lip on 1-2 mm below the white roll. These are very superficial intradermal injections allowing to make a hyperactive lower lip more oval. As summary, I recommend for correction of hyperactive forms of lips the following: Do not correct a contour of an upper lip with the linear technique! Perform augmentation only within the red border of lips. Do not inject filler into the white roll and the dermal part of the labium with the exception of the “Eiffel Tower” technique. For correction of an upper lip in the form of a seagull, use intramuscular vertical injections. For correction of lips in the form of a boat, intramuscular vertical injections and use subcutaneous fan injections. To combine intramuscular and hypodermic injection of filler in correction of a lower lip. To perform augmentation of volume of lips mainly by augmentation of volume of a lower lip. Optimum results are achieved by a combination of botulinum therapy and augmentation by filler. 1. Gubanova E (2009) Lips. Forms and aging. Aesthetic Atlas. M.: Vallex M.
2. Gubanova E (2012) Injection plastic of the red border of the lips: injection techniques. Bulletin of aesthetic medicine. 11 (3): 26-31. 3. Ananyan S, Vergun E, Stenko A (2006) Anatomical and functional factors of the effectiveness of injection plasty in the perioral area. Aesthetic medicine. 4. Redaelli A (2009) The Aesthetic Medicine //See-Editrice Firenze. – 2009. 5. Redaelli A, Saromytskaya A, Payne CR, Manturova N et. al. (2017) International experts recommendations on the use of AboBotulinum Toxin A (AboTA) for facial rejuvenation and primary hyperhidrosis. Cosmet Med (3)2: 70-80. 6. Narins RS, Bowman PH (2005) Injectable skin fillers //Clinics in plastic surgery. Т. 32. – №. 2. – С. 151-162. If you should be a trying to find a summertime occupation where it’s possible to acquire professional experience which may result in a more pro task after college then take a look at our job table for careers of graduate nature or the more pro.